This morning, I woke up at 6am, because I am determined to become a morning person again. Back in the old days (as in 2 years ago), I would get up at 5:30am, be at the gym by 6am, skip out of there around 7am, and get ready for my two jobs and full academic load. My mornings were actually pretty serene. After the initial misery of getting up early, I worked out, came home, made breakfast (I promise I'm getting to that), watched the Bachelor Pad, went tanning, and watched a chick flick while I got ready for work. For those of you who are wondering why I am in no hurry for a dog or a child, read that sentence five times and get back to me. I am free. 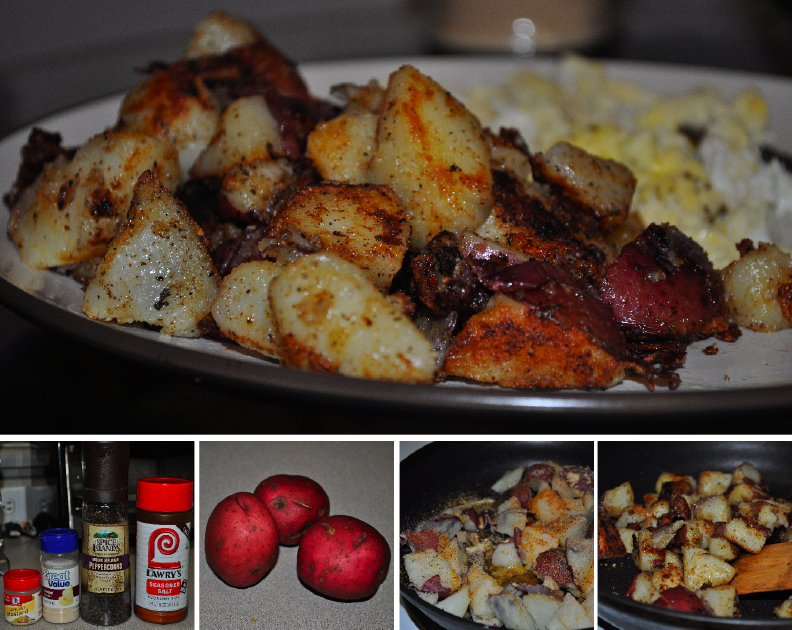 So for breakfast, I knew I wanted to revisit the typical eggs, bacon/sausage and potatoes. But I wanted to try something new, so I took a gamble. I've played with this a few times, and like I've said before, this is it. These are no fuss breakfast potatoes, but whoever you make them for will think you're some culinary genius who cares about their well-being much more than you actually do. Bottom line: they're 10x easier than they look. Zero prep and no hassle. So let's get to it. For me, this is about 20-25 minutes OR just microwave them for 6-7 minutes. That's what I do. If you don't want to use onion, use onion powder. Don't be intimidated by the loud sizzling and the steam. I made these one time with a girlfriend, and she was convinced I was either a) going to burn the potatoes, or b) burn the house down. They're supposed to do that. The potatoes will eventually brown, signaling that they're ready to be devoured by you. It's that easy! Serve this for your husband with scrambled eggs and either bacon or sausage, and you might come home to an unloaded dishwasher. I don't do onions, but I definitely do cheese. Bet these would taste great with that! Also, this would be a great dinner side dish!